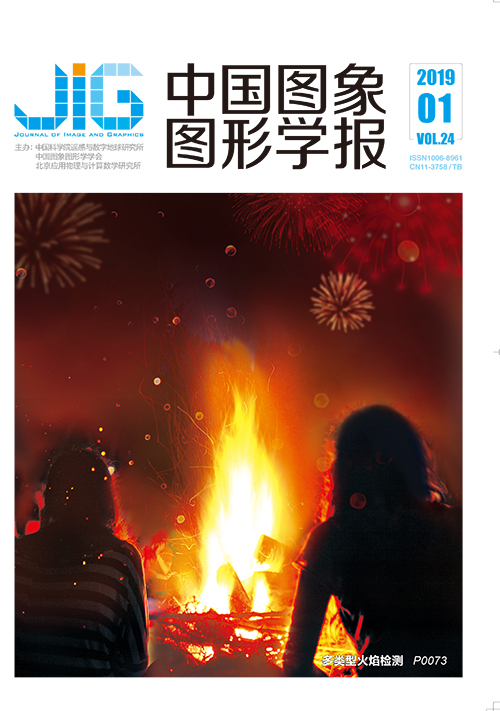 王永革, 男, 博士, 副教授, 主要研究方向为图像处理。E-mail:wangyongge@buaa.edu.cn. Objective Optical coherence tomography (OCT) is a 3D scanning imaging technology that has been widely used in ophthalmology as a clinical auxiliary to identify various eye lesions. Therefore, the classification technique of retinal OCT images is greatly important for the detection and treatment of retinopathy. Many effective OCT classification algorithms have been recently developed, and almost all these have artificial design features; however, retinal OCT images acquired from clinic usually contains a complex pathological structure. Therefore, the features from OCT images must be directly learned. Principal component analysis network (PCANet) is a simple version of convolutional neural network, which can directly extract the texture features of images, whereas features extracted by linear discriminant analysis (LDA) are more distinguishable for image classification. Combining the advantages of these two methods, this paper presents a PCANet with LDA (PCANet-LDA) for the automatic classification of three types of retinal OCT images, including age-related macular degeneration (AMD), diabetic macular edema (DME), and normal (NOR). 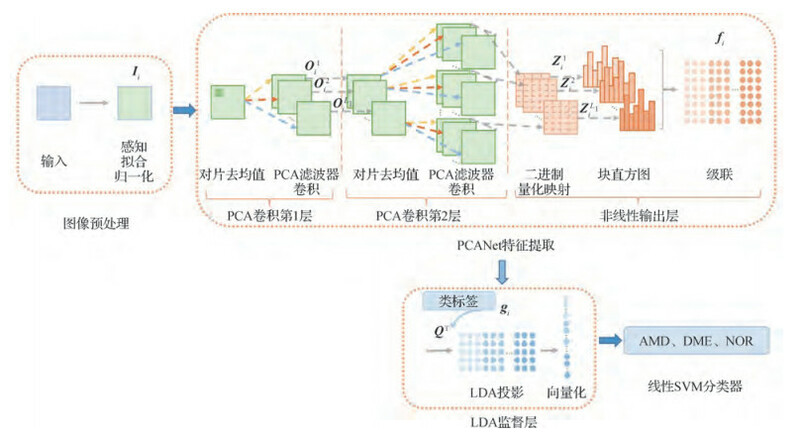 Method The proposed PCANet-LDA algorithm adds an LDA supervisory layer based on the PCANet to allow the supervision of extracted image features by class labels. This algorithm can be implemented in three steps. The first step is the OCT image preprocessing, which involves a series of preprocessing including perceiving, fitting, and normalizing stages on retinal OCT images to obtain an interested retinal region for image classification. The second step is the PCANet feature extraction, where the preprocessed OCT images are sent into a PCA convolution layer with two stages and a nonlinear output layer. In the PCA convolution layer, PCA filter banks are learned, and the PCA features of retinal OCT images can be extracted. In the nonlinear output layer, the extracted PCA features are translated to PCANet features of the input images by some basic data-processing components, including binary hashing and blockwise histograms. 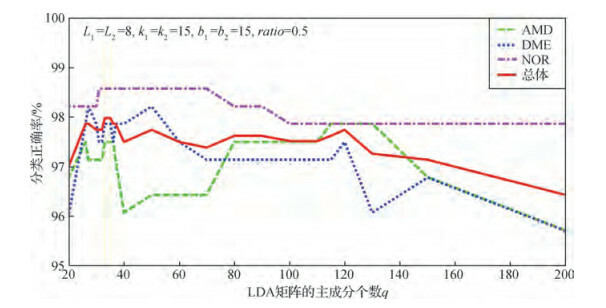 The third step is the LDA supervisory layer, which uses the LDA idea to learn an LDA matrix from the PCANet features with class labels of AMD, DME, and NOR. Then, the LDA matrix is used to project PCANet features into a low-dimensional space to make the projected features more distinguishable for classification. Finally, the projected features are used to train a linear support vector machine and classify the retinal OCT images. Result Both experiments are done on two retinal OCT dataset, including the clinic dataset obtained from a hospital and Duke dataset. 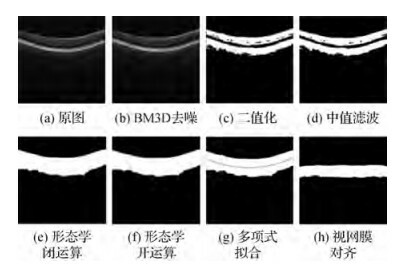 First, the comparative examples of AMD, DME and NOR retinal OCT images before and after preprocessing shows that the image preprocessing cuts out the non-retinal regions in the OCT image, leaving the meaningful retinal areas. Moreover, the remaining retina is rotated to a unified horizontal state to reduce the impact of inconsistent direction of retina on classification. Then, the sample PCANet feature maps extracted from AMD and DME retinal OCT images show that the PCA filter trained by PCANet tends to capture meaningful pathological structure information, which contributes to the classification of retinal OCT images. Finally, the correct classification rates of the PCANet algorithm, the ScSPM algorithm, and the PCANet-LDA algorithm proposed in this paper are compared. On the clinic dataset, the overall correct classification rate of the PCANet-LDA algorithm is 97.20%, which is 3.77% higher than that of the PCANet algorithm and slightly higher than that of the ScSPM algorithm. On the Duke dataset, the overall correct classification rate of the PCANet-LDA algorithm is 99.52%, which is 1.64% higher than that of the PCANet algorithm and a slightly higher than that of the ScSPM algorithm. Conclusion The PCANet algorithm can extract effective features. Accordingly, the PCANet-LDA algorithm obtains more distinguishing features by LDA method, to yield a higher correct classification rate than that of the PCANet and ScSPM algorithms; the latter is a state-of-the-art two-dimensional OCT image classification of the retina. Therefore, the proposed PCANet-LDA algorithm is effective, advanced in the classification of retinal OCT images, and can be a baseline algorithm for retinal OCT image classification. Chan T H, Jia K, Gao S H, et al.PCANet: A simple deep learning baseline for image classification?[EB/OL].[2018-02-21]. http://mx.nthu.edu.tw/~tsunghan/download/PCANet_demo_pyramid.rar. Yang J C, Yu K, Gong Y H, et al. Linear Spatial Pyramid matching using sparse coding for image classification[EB/OL].[EB/OL].[2018-02-21].http://www.ifp.illinois.edu/~jyang29/ScSPM.htm. Srinivasan P P, Kim L A, Mettu P S, et al. Fully automated detection of diabetic macular edema and dry age-related macular degeneration from optical coherence tomography images[EB/OL].[2018-02-21]. http://www.duke.edu/~sf59/Srinivasan_BOE_2014_dataset.htm.